The Curtiss SB2C Helldiver was a carrier-based dive bomber aircraft produced for the United States Navy during World War II. It replaced the Douglas SBD Dauntless in US Navy service. Despite its size, the SB2C was much faster than the SBD it replaced. Delays marred its production; by the time the A-25 Shrike variant for the USAAF was deployed in late 1943, the Army Air Forces no longer had a role for a dive bomber. Other factors also contributed in its service introductions, due to the poor handling of the aircraft, both the British Royal Navy and the Royal Australian Air Force cancelled substantial orders for the type. The Truman Committee investigated Helldiver production and turned in a scathing report, which eventually led to the beginning of the end for Curtiss. Although production problems persisted throughout its combat service, it was reported that some pilots soon changed their minds favorably about the potency of the Helldiver, and in spite of its problems, the aircraft was flown through the last two years of the Pacific War with a fine combat record, due to the high training of its crews. The major identifying feature of the -4 compared to earlier models is the inclusion of underwing rocket rails. I am not sure what is driving Cyber-hobby's recent release of kits, but I am glad to see them producing some of these as it is nice to have a choice when it comes to model kits. 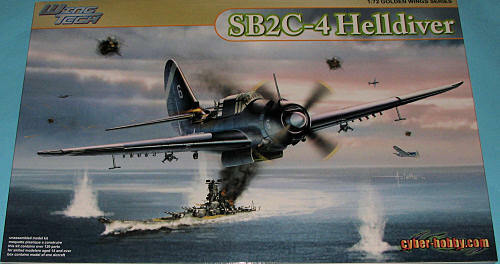 Previously, the SB2C was released by Airfix, then Matchbox, then a long period of time with no new Helldiver releases in this scale until Academy did theirs a few years back. Now we have a new tool kit from our friends in Honk Kong. Though I have listed all of the goodies from the Cyber-hobby PR folks, a few things I though was neat. First of all, the rocket rails are a wing insert, which tells me that other versions are going to be done. Hopefully the -5, a version that has never been kitted and was used post-war by the French. Another is that you get the option to have the rear fuselage section raised or lowered and it is well done with different inserts for each. 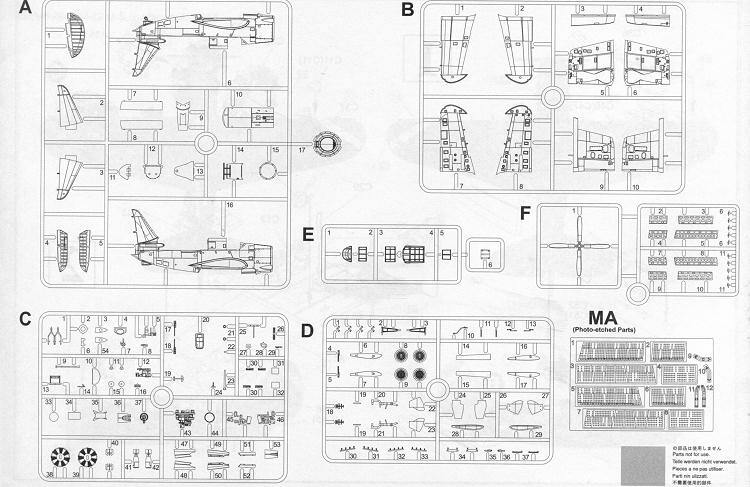 Though the instructions show that all the clear bits allegedly have options, there are none. I am not sure if the canopy sections can be stacked in the open position, but I sincerely hope so. I would have liked to have seen rockets, but one can always rob them from another kit. 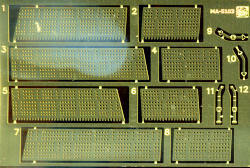 There are markings for three units. First is the box art squadron, VB-80 aboard the USS Hancock in 1945. This is overall gloss sea blue. In the same color is the next option from VB-87 on the USS Ticonderoga in 1945. Three different aircraft numbers are offered for this unit. The last is in the older tri-color scheme from VB-3 aboard the USS Yorktown, also in 1945. On this lane the white fin area will need to be painted. Decals are nicely done and should provide no issues. I also think that the aftermarket crowd will soon be providing other options. As you can see, this is a very nice kit, but then so is the older Academy boxing. 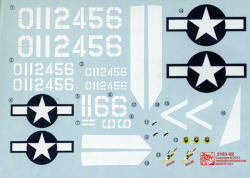 Typical of the Cyber-hobby crowd, this one offers a ton of options and detail so is sure to be a rather popular kit.